Lost in a sea of dirty dishes, the aftermath of a dinner mostly liked by my children, I heard the familiar ding of my phone with a text, a welcome distraction from the casserole dish I was scrubbing. Expecting it to be a reminder for my son’s next baseball practice, I was delighted when instead I saw the name of a college student I had been a high school youth leader for. “What does it mean to trust the Lord?” she asked. “I mean, what does that really look like?” I smiled, remembering all too well the ending months of my college career, unattached, and unsure what life held for me after graduation. Waiting for God to give direction, I had those thoughts as well. But the funny thing is, I’m still having those thoughts. Only now the question marks aren’t “Who I’m going to marry?” or “Where am I going to live?” Those answers have come. Now I’m waiting on God to heal in ways I never saw coming. Waiting on God to move in the lives of my unsaved friends. Waiting on God to bring revival. Waiting on God to provide. Waiting on God to direct. Waiting on God to open or close the doors of a future ministry. And I’m still asking, “What does it mean to trust the Lord?” I mean, what does that really look like? In the years since college, I’ve realized waiting is just a part of life. But more importantly, it’s part of the Christian life. Hebrews 11 says the saints who have gone before us—Abraham, Isaac, Jacob, Moses, and others—though counted as faithful, are still waiting. They’re waiting for the promise of God, the kingdom of heaven, “the city that has foundations whose designer and builder is God” (Heb. 11:10). They were waiting for the coming of Christ, while we are waiting for the return of Christ. For “we know that when he appears we shall be like him, because we shall see him as he is” (1 John 3:2). One day we’ll be free of our sinful bodies. One day there will be no more pain and suffering. One day Christ Himself will wipe away the last of our tears (Rev. 21:4). But in the meantime we wait, because it’s in the waiting that faith grows. It’s in the waiting that we learn to trust, to wait with patience and perseverance and not give up on the God who doesn’t give up on us. Romans 5:4 says, “endurance produces character, and character produces hope.” In other words, waiting makes space for hope to grow. “And hope does not put us to shame, because God’s love has been poured into our hearts through the Holy Spirit who has been given to us” (Rom. 5:5). We know God loves us, but how long must we wait? As expectations go unmet, it’s in the waiting that doubt creeps in and untrue thoughts invade and strong feelings take over, giving the enemy a foothold. Because every time we fix our eyes on unmet expectations instead of Jesus, the enemy has the perfect opportunity to steer us off course. In particular, Satan wants us so discouraged we’ll either give up, walk away, or, better yet, be so consumed with anxiety and hopelessness that we’re a dismantled member of God’s kingdom. Sidelined—that’s what the enemy wants for believers. Jehoshaphat was waiting on a word from the Lord. The enemy was closing in, and there was nothing he could do. But he waited well. He took his concerns to the Lord. He focused on the promises of God and set his face to seek the Lord (2 Chron. 20:3). He believed the spoken word of God’s prophet and fell on his face in worship, leading all of Judah to do the same. And in worship, victory came. To trust God in the wait is to worship God in the wait. And when we too believe the Word of the Lord, focusing on the promises we’ve been given and the eternal life to come, worship is possible. Even in the hardest of moments, the longest of waits, the deepest of doubts, we can worship because of the gospel. Because of hope and new life. Worship is our rescue, my friend. It’s the evident outpouring of a heart fixed on God. When we can worship in the wait, we will wait well. Raising hands of praise to the Lord in seasons of uncertainty silences the enemy and ushers in victory. Aligning our heart with what’s true and right, worship keeps us focused on the sovereign and holy God who will never forsake us and always does what’s best for us. The LORD is good to those who wait for him, to the soul who seeks him (Lam. 3:25). So sing a song of praise, dear sister, in your heart or with your voice. Ascribe to the LORD the glory due his name; worship the LORD in the splendor of holiness (Ps. 29:2). As you’re doing dishes, as you’re picking up kids, whatever you are doing, wherever you are at, sing to the Lord a new song. He is worthy of all our praise. Maybe you too have wondered what it really means to trust the Lord. Maybe trust has felt like a far-off concept or a difficult mountain to climb, but it’s not. The enemy only wants us to think it’s too hard, but trusting God is simply worshiping in the wait. And with a God like ours, we can do that. 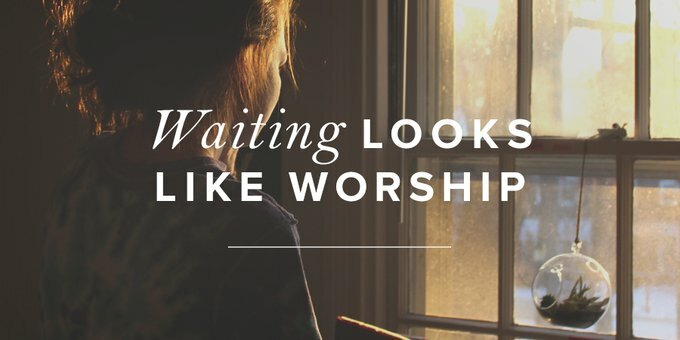 We can worship while we wait, and we can wait well. And then no matter what the outcome, victory will be ours for the taking. “Wait for the LORD; be strong, and let your heart take courage; wait for the LORD!” (Ps. 27:14). For He is faithful and trustworthy, and His timing is always perfect.